This entry was posted on Tuesday, July 19th, 2011 at 23:12 and is filed under Politics, Ron Paul. It’s obvious that Representative Paul has a staunch following that supports him come what may. Ignoring the legion of so-called ‘Paul-bots’ who seem able to descend on every internet poll and straw poll like flies to a carcass, I wonder more about the nature of their support. I’ve known a number of Ron Paul’s supporters, and they seem to have some very good ideas, but the ideas they offer aren’t in any way impeded or tempered by reality. While I also like some of Ron Paul’s positions, he suffers from an all-too-convenient naiveté with respect to certain issues that make of him a questionable candidate at best. Despite his virtues on some very important issues, his moral agnosticism on others brands him unsuitable to restore the American nation, now wounded and bleeding profusely in the escalating Obama disaster. Mr. Paul is strong on general economic principles, but weak on firm ideas for implementation of them. He says he would do many of the things in the sphere of economics that would likely serve to improve the general economy, and his notions about private property rights(including earnings and wealth) are fantastic. In this respect, he is far superior to the RINO contingent that is composed of Romney, Pawlenty, Huntsman and Gingrich, and it certainly exceeds the macro-economic worldview of former Federal Reserve Board member Herman Cain. The problem is that Mr. Paul doesn’t tell us anything of substance about what he would do to reform things. Yes, he supports the US Constitution’s view of a laissez faire economy, but he doesn’t ever get around to explaining in detail where he thinks government involvement should begin, if ever. Mr. Paul is also strong on his general commitment to deal with our ballooning entitlements problem. His view on how to implement a solution is nevertheless far too radical for the general public. He would, if he could, end all entitlements today. For a person like me, who studies economics, it’s a numerically satisfying answer, but the truth is that such an approach would never likely see the light of day, and would wrench people from their current situations, already stressed by inflation, and deposit them directly into poverty. I hardly see such an abrupt, ham-handed approach to entitlement reform as plausible, never mind practical. It’s simply not something you could end overnight, though it’s certain that you could begin on that path with a more pragmatic plan. This one issue guarantees that Mr. Paul cannot be elected. With over 60% of the public receiving some form of non-wage payment from the Federal government, it’s clear that such a constituency dooms Mr. Paul’s candidacy once they understand his views fully. Mr. Paul is likewise a critic of the Federal Reserve. He realizes that the Fed constitutes an un-elected, un-accountable body that has far too much power in the general economy. Having never been audited by Congress, Mr. Paul rightly explains that we need to examine the Federal Reserve with a mind to sun-setting the institution. Once again, while it’s easy to make such profoundly sweeping statements because they appeal to large numbers of people, the truth is that there can be no easy removal or replacement of the Federal Reserve’s functions without substantial planning. He offers none of that. There is at least one other Republican prospect who has challenged Federal Reserve policy, but Mr. Paul’s ‘ejection seat’ mentality is not a serious way to begin. The seat of Mr. Paul’s popularity seems to be with the drug legalization crowd. When viewing lop-sided poll results on some website, it is tempting(and probably not far off the mark) to imagine a legion of basement-dwelling ne’er-do-wells who like to smoke a bit of the wacky-weed as they wax philosophic on their pro-Paul blogs. Still, it’s fair to say that there is an undeniable logic to Rep. Paul’s view that as sovereigns over their own lives and bodies, people ought to be able to choose freely what to inject or snort or smoke. I fully understand this libertarian lynch-pin, but I also recognize that until you put in place a system of absolute civil and criminal liability for the conduct of people under such influence, there can be no practical manner in which to protect the rights and the lives of the rest of us. At a cocktail party, I’m sure it’s a fine-sounding policy position, but in practice, that becomes just so much happy-talk once a person’s life has been snuffed by an officially sanctioned cocaine-snorter who takes them out in a head-on. 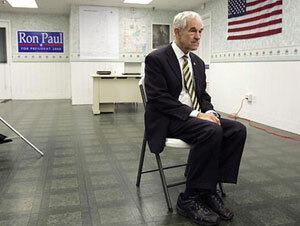 Mr. Paul also seems to be the beneficiary of true isolationism. I view isolationism as the naive view of the world that believes it is possible to withdraw to your own borders, and expect the rest of the world to simply leave you be. I am supportive of withdrawing our troops where they are not really needed in the furtherance of our vital interests, and I am much in favor of the idea of telling the United Nations to pack up and re-establish their socialist playground in Brussels, but I also realize that this is a dangerous world growing still more dangerous as nuclear weapons are now in the hands of the Pakistanis and North Koreans, and will soon enough be in the hands of the Iranians. Any person who thinks that the United States will be safer as a result of a global withdrawal simply isn’t playing with a full deck, and constitutes a danger to the country through a genuinely adolescent view of the world. In much the same way, Ron Paul seems to believe that the withdrawal of all foreign aid of any sort will bear budgetary fruits while reducing our moral hazards. Again, Mr. Paul is simply wrong, and while foreign aid has long been the object of sloganeering, the truth is that total US foreign aid is a tiny proportion of our budget. I believe we need to examine all of it, but I also know that some of it does bear fruit. For instance, we’ve supported Israel at some expense, but by doing so, we’ve also generally maintained a higher level of stability than would otherwise result. Why do we care? Simply put, until we have a President committed to developing our own energy resources, our economy depends upon the energy source that is the Middle East. Pretending this isn’t the current situation won’t protect us from the consequences. There are other prospects who more thoroughly understand the importance of developing our own resources first. While we develop our own energy resources, the stability of the Middle East is critical to our nation’s health. Just the last eight months of events in the region, and their effect on the global economy, demonstrates the point in economic terms in a way no mere policy position ever will. Mr. Paul claims to support the constitutional concept of federalism, but it’s a tainted view of federalism that contemplates a level of latitude to states they ought not possess with respect to the rights of individual citizens. Under our constitutional system, if a right exists, it exists in all places under our constitution at once, and is not subject to the vagaries of state or local governance. This dangerous misunderstanding of federalism would allow states to restrict rights otherwise made explicit by the Constitution. Freedom of speech ought not be a concept restricted to observance by federal departments alone. Doing justice to Mr. Paul requires an honest examination of his positions. He’s formidable on a number of issues in the essential sphere of economic liberty, but sadly, that’s where Mr. Paul’s value as a candidate ends, in large measure because he proposes no practical method by which to implement these ideas in law. Stating these undeniable truths about Ron Paul’s glaring shortcomings is to do justice to the electorate. There are others who understand the realities of our dangerous world. Many Paul supporters believe it is impossible to vote for any other candidate without falling prey to the ‘lesser of two evils’ choice. I beg to differ, but were I to consider who belongs on the very short list of ‘not evil,’ it wouldn’t include Dr. Paul, if only because it is impossible to suggest, with a straight face, that Mr. Paul, having served in Washington as long as he has, doesn’t understand the clear danger of his undeveloped and ambiguous policy generalizations, and if he does, it is impossible to place Paul on any such list. You have a very ignorant and poor view of what Dr. Paul proposes. For instance, you state that Dr. Paul would just end all entitlements. This is a lie. He has always said that the government must honor it's obligations to the people and that entitlements will have to be phased out as people once again become used to the idea of personal responsibility. He is a kind and moral man and would never just yank the rug out and cause chaos and starvation. To imply that is an outright fabrication. There are already laws in place (such as the Constitution) for how our economic system should be run. The Treasury Department could easily take up the necessary functions of the Federal Reserve, without charging us interest on our money. Unconstitutional agencies could and should be eliminated with huge cost benefits immediately to taxpayers. Going back to running the government on tariffs and excise taxes would eliminate the need for the IRS and an income tax, which would be a huge boost to productivity. Overnight the U.S. would become the premier place to do business in the world! Giving power back to the states (via the 10th Amendment) does not mean that they can abrogate the Bill of Rights or go against the Constitution. Ron Paul would oversee the greatest economic boom this country has ever seen. Ending unconstitutional wars and closing unnecessary foreign bases, along with ending foreign aid would also save us money. Empire building has destroyed every nation which has indulged in it. If we bankrupt ourselves economically, then our enemies win without us firing a shot. I suggest you read that last sentence more than once and cogitate on it for awhile. The only people that win when wars are fought worldwide are the bankers, who care not what the issues are, they finance both sides and get countries into unpayable debt servitude while lining their pockets as the little people send their children to die. This is just insane. I am sure that Ron Paul would evaluate any REAL threats to our country and respond accordingly. Unlike other empty suit political candidates, the man can reason and think. The drug war (like other Federal programs) is extremely expensive, invites corruption (the government uses it to fund black ops), is destroying Mexico and some South American countries and unlike you seem to think — IT DOES NOTHING TO IMPEDE DRUG USE! Prohibition of alcohol failed in keeping people from drinking and prohibition of drugs does not work either. Drug abuse should be treated as a health problem, as alcohol abuse is. The drug war merely creates a huge mafioso crime network and destabilizes other countries. It is a complete AND UTTER FAILURE. If you think it should be continued, then you are ignoring the facts. If you like Ron Paul on the economy, then you had better vote for him, because if we are destroyed economically that will be the end of this country as a world power. There is not one other candidate who even has a wisp of a CLUE of what needs to be done regarding our complete and total economic incompetence and failure to face monetary reality in this country. I would go so far as to say we are completely doomed to becoming a third world country WITHOUT RON PAUL, who has the courage to take on the criminal banking syndicate now running this country for it's own benefit. Ron Paul has been consistent his whole political career. He has the voting record to back up his principles. Which, oddly enough, are the very principles which founded this nation and allowed it to become prosperous. If you have a problem with Ron Paul, then you don't believe in the Country that the Founding Fathers envisioned and I suggest the you take it up with George Washington, Thomas Jefferson, James Madison, Thomas Paine, Patrick Henry, Samuel Adams and the like. Bash them as well. And while you're at it, rip up the Constitution and throw it in the trash and bow down to your socialist/communist/bankster overlords while they strip very last vestige of wealth from this country. Put the chains around your own feet and get ready for servitude. We are on our last legs here, and if you don't realize it, you are not paying attention. If you wonder why Ron Paul people seem a little fanatical, it is because we KNOW this is the end, we know there is little time left, we know the truth of what the Country is facing. Why are we screaming? BECAUSE THE FRICKING BUILDING IS ON FIRE AND YOU NEED TO DO SOMETHING NOW! You have a very ignorant and poor view of what Dr. Paul proposes. For instance, you state that Dr. Paul would just end all entitlements. This is a lie. He has always said that the government must honor it’s obligations to the people and that entitlements will have to be phased out as people once again become used to the idea of personal responsibility. He is a kind and moral man and would never just yank the rug out and cause chaos and starvation. To imply that is an outright fabrication. I do have a negative view of Dr. Paul and his proposals. It is not, however, an ignorant view. It's based on his own speeches, writings and policy positions. If you feel I am ignorant, I'd ask you to consider his own position. He holds(and I wouldn't disagree) that social security and other such entitlement programs are unconstitutional. If you hold this view, there is only one correct answer: The program must be closed down. Are you suggesting he doesn't believe what he says, or isn't sincere about it? How can you 'ease off' an unconstitutional program, as Ron Paul has described it. If it is determined to be unconstitutional, it must be closed down TODAY. Yes or no? Sso if Mr. Paul is arguing that social security is unconstitutional, but he simultaneously proposes a staged 'ease off' program to eliminate it, what you're saying is that he's willing to compromise his beliefs. According to you Paulbots, any sort of yielding to pragmatism is unconscionable. Well, which will it be? You have a choice: Either Ron Paul supports eliminating social security on day one because it's unconstitutional, or he's another 'sell-out.' Which? Au contraire, Mr. Paul says that abortion is an issue to be decided by states. If there is a federal right to life, as I believe exists, what then is Mr. Paul's position on individual states legislating otherwise? Either way? If you believe it's a woman's right to murder her unborn child, Mr. Paul offers that states may decide on their own to abrogate the rights of that woman, but if the state says there exists no such right, then Mr. Paul supports the right to life. This sort of duplicitous stance is intended to let Mr. Paul off the hook on a difficult issue. Nothing more. Nothing less. Any President who sought to reverse the programs and spending would preside over the greatest boom in history. Your isolationist views, however, are completely naive. Your reference to the bankers in the context of foreign aid I mentioned particularly with respect to Israel smacks of anti-semtism, and I won't tolerate it, whether it's stated openly, or hidden behind a load of inane protests about foreign aid. I am not sure, at all, that Ron Paul is capable of evaluating real threats to this country, nevermind responding accordingly. He may be able to reason and think, but one should have some idea about what one would do with respect to a specific conflict. Mr. Paul's remarks with respect to Israel have been vague or naive. Oviously, you have a reading comprehension problem: I don't give a damn what you drink, inject, snort, smoke or swallow. It's not my affair, within the vacuum of your own life and home. That said, until we have a law that will appropriately hold you liable with civil and criminal penalties should any state of diminished capacity due to the effects of any of these, we must control them. In short, and for the record, if you snort cocaine and head down the road and wipe out a family, you should get the death penalty and surrender everything you own by way of compensation. Do you get it? With freedom comes responsibility, but until we have laws that will hold you entirely liable for your actions, then the answer must be no. So, make the laws to hold folks fully responsible in both civil and criminal proceedings, and I will be happy to turn loose all you dope-smokers. We'll be getting rid of some of your number in short order, at that point, anyway. If you like Ron Paul on the economy, then you had better vote for him, because if we are destroyed economically that will be the end of this country as a world power. There is not one other candidate who even has a wisp of a CLUE of what needs to be done regarding our complete and total economic incompetence and failure to face monetary reality in this country. I would go so far as to say we are completely doomed to becoming a third world country WITHOUT RON PAUL, who has the courage to take on the criminal banking syndicate now running this country for it’s own benefit. This messianic view of Ron Paul, that only he can save us, is preposterous. I support a different candidate, who has been equally critical of the Federal Reserve, and yet you don't notice her. You've allowed yourself to become a tool of the left in order to propagate your wish for drug legalization, pure and simple. Ron Paul has been consistent his whole political career. He has the voting record to back up his principles. Which, oddly enough, are the very principles which founded this nation and allowed it to become prosperous. If you have a problem with Ron Paul, then you don’t believe in the Country that the Founding Fathers envisioned and I suggest the you take it up with George Washington, Thomas Jefferson, James Madison, Thomas Paine, Patrick Henry, Samuel Adams and the like. Bash them as well. And while you’re at it, rip up the Constitution and throw it in the trash and bow down to your socialist/communist/bankster overlords while they strip very last vestige of wealth from this country. Put the chains around your own feet and get ready for servitude. We are on our last legs here, and if you don’t realize it, you are not paying attention. I am, probably more than anybody else I know personally, completely aware of the stakes. That's why I'll be supporting a candidate that can actually address these problems. She too knows what the founders said and believed. You're not merely fanatical. Many among your number are cheaters(polls & etc,) liars(selves and others,) and ne'er-do-wells(seeking legalization without responsibility.) The building is indeed ablaze. There are other candidates who realize this, and I will support one of them. Part of the problem with ROn Paul is his supporters. While the country is burning, we must fight the fire, but I don't call a brigade of hopped-up dopeheads to put it out. Your reply shows you for what you are — a liar and a coward. I notice you don't name which candidate you are supporting — why not? Just because I support ending the drug war does not mean that I don't think people who injure someone else shouldn't pay. We already have laws in place for that — drugged up or not. To act like anyone who thinks that the War on Drugs should be ended is a Druggie as you imply is completely a non-sequitur argument. I don't do drugs. Apparently you do a perfectly fine job of being delusional without them. You're trying to imply that I am anti-semitic because I support Ron Paul's ending of foreign aid. Yes it does end aid to Israel, but we give far more to Israel's enemies than to Israel, so I think it is a net gain for them. By the way, my boyfriend is Jewish. Trying to imply because I understand that a criminal banking syndicate (NOT JEWISH) runs our government means I am anti-semitic is another ad hominem attack and completely baseless. I could say more about all of your points but you are obviously so clueless that I would be wasting my breath. Ron Paul is easy to attack because he has published volumes (books and articles) throughout his career of where he stands. Obviously you feel safer voting for someone who talks in sound bites and never says anything so that you can just IMAGINE that they will somehow do what you want. A friend asked me to respond to you, so I did. Your reply shows you for what you are — a liar and a coward. I notice you don’t name which candidate you are supporting — why not? Just because I support ending the drug war does not mean that I don’t think people who injure someone else shouldn’t pay. We already have laws in place for that — drugged up or not. To act like anyone who thinks that the War on Drugs should be ended is a Druggie as you imply is completely a non-sequitur argument. I don’t do drugs. Apparently you do a perfectly fine job of being delusional without them. How could you possibly visit my site without being able to identify, in approximately 2.2 seconds, which candidate I support? You've offered no evidence of a lie, or of cowardice. This is what's called the 'put up or shut up' moment. Our laws don't have the sort of absolute liability, both criminal and civil, that such a policy on drugs would require. More, I'd want an explicit provision that the taxpayers are not liable for rehabilitation programs. It is true to say that I do not know whether you use drugs. I know a large number of Paul-bots who do, and that's what my experience tells me to expect. It may lead to the occasional fallacy of composition, but it's served me fairly well as a general rule. You’re trying to imply that I am anti-semitic because I support Ron Paul’s ending of foreign aid. Yes it does end aid to Israel, but we give far more to Israel’s enemies than to Israel, so I think it is a net gain for them. By the way, my boyfriend is Jewish. Trying to imply because I understand that a criminal banking syndicate (NOT JEWISH) runs our government means I am anti-semitic is another ad hominem attack and completely baseless. I try to imply nothing. I am directly stating that a large number of Ron Paul's followers are motivated, at least in part, by anti-semitism. For many of them, the term 'criminal banking syndicate' is simply code for their one-world-jewish-conspiracy bigotry. If you're not part of that thinking, congratulations, but by accepting them as part of the wider Ron Paul supporting community, you're not doing yourself any favors. Please, by all means, say more… I suspect most of what you have to say matches the quality of what you've said so far, which is to say it won't be very constructive. Translation: You've got nothing. Ron Paul is easy to attack because some of his views are downright kooky. This poisons the well of his better ideas on some issues to the extent that he is un-serious as a candidate. linked to your site from THE BOOK OF SARAH. I highly recommend it to anyone looking for the truth. Just about every article written about the incredible lady from Alaska can be found there. i enjoy reading your posts. informative with a point of view I do not normally see on other sites. I am pleased to here that you got your daughter back. I will be returning regularly and bringing friends. momentum is growing!! Can you feel it? I am growing ever more excited as 2012 approches. time to return our constitution to its rightful place. priority one1 And I only see one candidate that can effectively do this. The warrioir from Wasilla, a mother of five, Madame President! Thanks Kevin! The momentum is growing! Funny to find that you support Palin. When the Ron Paul campaign went to Alaska in 2008, all the Palin supporters showed up to support Ron Paul. Palin herself has said that she likes Ron Paul. Wow, I guess that means that you can’t support Palin anymore since many of her supporters were wacky Ron Paul people and she likes him herself. How amusing to watch you twist yourself into a pretzel over that one! Don’t let the doorknob hit her as you throw her out! You know, there's nothing wrong with liking Ron Paul. I said it myself: I like Ron Paul.. There's a difference, however, between liking Ron Paul and thinking Ron Paul ought to be President..
Once you admit that one can think both ideas, simultaneously, it more or less dispenses with your argument, doesn't it? Great, just what we need is Ron Paul bashing. Even the left doesn't do this to their most virulent strain of stupidity. On the other hand, you have but a handful of principled constitutionalists and people cannot help but find fault? It's beyond me, but it will be the reason the right gets nowhere and we keep moving further left. Can we at least attempt more unity. How about a column on how much more sensible Ron Paul is than practically the rest of Congress, for a change. As far as substance, you need to do more homework. Ron Paul has substance, but perhaps folks need to take a little more time to listen. He has said that we could not dump all entitlement programs, he said he would protect social security, while reforming it. I would love to get rid of entitlements tomorrow, but I know that is not practical as Ron Paul has stated himself. He may be "called" an isolationist, but only relative to the idea of the Bush Doctrine, pre-emptively striking countries you perceive to be a threat and establishing democracy. As far as the military, you can bet Ron Paul is a hawk when it comes to protecting national security and national interests. Is this isolationist? I think not. People don't think of China as isolationist, yet they don't involve themselves unnecessarily in world affairs. I think we need to re-evaluate our definitions. Abortion as a states rights issue is entirely constitutional. I am vehemently pro-life. Drug use- you are right on in regards to your comments here. I believe Ron Paul's policy would reflect a quid-pro-quo that would require more personal responsibility in exchange for more open drug use. I don't agree with Ron Paul or anyone for that matter on everything, but he is more consistent, more logical, and more educated on the constitution and the founding documents than almost anyone else in washington. I wager that you would find yourself agreeing with Ron Paul more as you understand his positions better. Scott, I am not Paul-bashing, though you might think so. I actually agree with a good deal of what he says, and I also agree that he's tremendously better than most of the other Republican candidates. You'll get no argument from me on that. I like Dr. Paul. Always have. To tell you the truth, one of the biggest problems I have with Paul is that some of his followers are really, really out there. Not all. Probably not most. The problem this presents is that he's not a very forceful personality, and inasmuch as that's the case, it can be dangerous if the wrong sort take over your camp. I'm NOT saying that has happened, but I think you understand my larger point. I too am pro-life. I'm also pro-free speech. And private property rights. I know that States cannot decline to allow me free speech or property rights in complete disregard of my constitutionally guaranteed rights. Follow with me a moment, I'm getting there: If my right to keep and bear arms cannot be negated by states' actions or laws, why should my right to life be any different? The moment you admit this, then the question of states' rights in the matter of abortion becomes silly, doesn't it? I've been listening and reading Ron Paul since before he was popularized in the mid-late nineties. I'm glad you understand my point on the drug issue. As I told a previous Paul supporter, I couldn't give a rat's hind end for what adults wish to do to themselves, if at the end of the day, they're bound and determined to do it. I just want strong legal recourse in place, first. Economics-wise, Paul is mostly spot-on, and I will go as far as to say that I'm a firm critic of the Federal Reserve system too. There are other candidates who have been fairly critical as well. 4. Abandoning Israel will hasten the day when we will be forced to swat like crazy. In short, I view our relatively meager assistance to Israel as a deterrent. You may disagree with that, but I look at the potential cost in blood and treasure if Israel were attacked, and I know the American people would not countenance another holocaust of the sort some of the Islamicists desire. It would be a terrible war, and therefore if providing a few billions in loans and defense aid is what it takes to help them defend themselves, I view it as a USGI-Body-bag prevention fund.